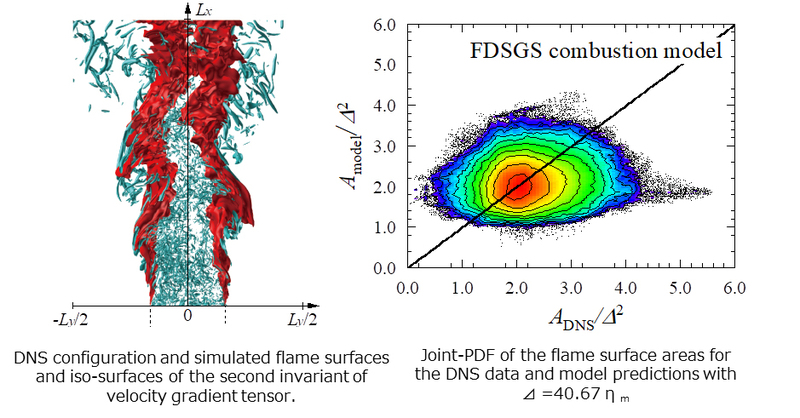 A Fractal Dynamic SGS Combustion Model for Large Eddy Simulation of Turbulent Premixed Flames. Direct numerical simulation of a turbulent hydrogen-air premixed plane jet flame is performed to investigate fractal characteristics and to evaluate the fractal dynamic subgrid scale (FDSGS) combustion model. 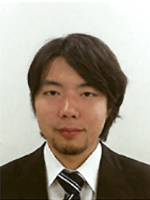 Katsuhiro Hiraoka, Yuki Minamoto, Masayasu Shimura, Yoshitsugu Naka, Naoya Fukushima and Mamoru Tanahashi, A Fractal Dynamic SGS Combustion Model for Large Eddy Simulation of Turbulent Premixed Flames, Combustion Science and Technology, 188 (9) 1472-1495 (2016). Estimating combustion characteristics under the conditions of super lean, high EGR ratio, high intensity turbulent flow is necessary to realize 50% of thermal efficiency on SIP engine. In this study, combustion characteristic of high intensity turbulent jet flame was calculated by Direct Numerical Simulation(DNS) and it showed that the result of LES didn’t contradict that of DNS. This result shows a possibility of an estimation of combustion characteristic under the high intensity turbulent flow by applying FDSGS to LES of HINOCA developed by SIP and it becomes an important achievement for the development of SIP engine.